Whether you’re a professional looking for a replacement or a newcomer to the welding field, we’ve got a list of products you’re going to want to look at! Our stick welder buying guide gives you the heads-up on the best of the best when it comes to these powerful machines. If you’re new to the field, we’ll walk you through what you should be looking for first. Then we will bring on the welding machines! Voltage: A higher voltage input usually means that the welder is going to put out more power. You might need a sturdy electrical setup for these machines, but a higher voltage is a better value and definitely the way to go. Amperage: The amperage definitely makes a difference for stick welders; thicker sticks need more amperage to melt and secure the objects that you’re welding together. For bigger projects, you need a higher possible amperage rating, while thinner sticks need less. Cable Length: In advanced welding, the length of the welding cable usually determines how much power you’re going to get. A 50-foot cable won’t give you as much electricity as a 6-foot cable, as an example. But different types of welding require different lengths. Pieces Included: This refers to the number of pieces that come in the set. Some stick welders come with additional cables and attachments, so make sure that you know what you’re actually paying for when you buy a package. Size: This is the dimensions of the unit, which is important if you’re looking for something to fit in your shop or garage. Make sure you get one that’s going to fit in the space so it’s easy to operate. Warranty: A warranty is in place to protect you and your purchase. If there’s a defect from the manufacturer, a warranty will make sure that you either get a full refund or a working replacement product at no cost. Now that you’re a little more in-the-know, we’ll take a look at some of the best welding machines we could find. Our stick welder reviews were created with you in mind! We want to recommend the best products to you, so you should check out our top pick and budget pick first. After, take a look at the rest of our list for more amazing machines. You’re sure to find the one that’s best for you! Our top pick is the AHP AlphaTIG Stick Welder. This amazingly powerful machine can weld 1/4” aluminum and 3/8” mild steel, which is amazingly thick parameters for a portable machine! It can do aluminum, stainless steel, and even gets a precise welding edge on thinner materials, which is a lot harder to do. It has HF start for easy arcing and includes a foot pedal to keep constant pressure going. The quality is definitely professional, while the price is anything but. It’s the best stick welder for the money on our list! It performs so well on both available voltages and has such amazing versatility for a welder. If you’re the type that wants to put a trigger on the torch, it comes with a control switch that you can easily change out. We think that is pretty awesome customizability! It even has a full range of pulse features to keep all of your welds looking great! 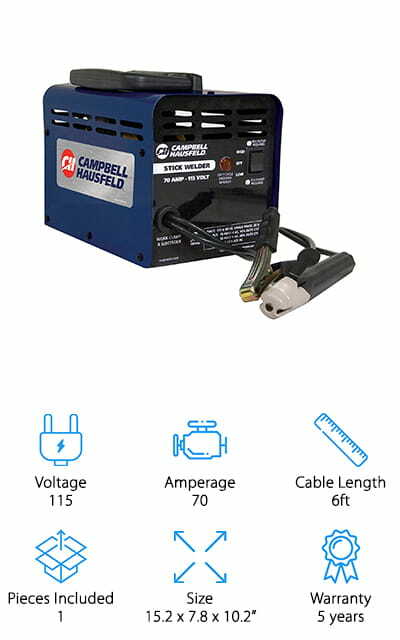 The Campbell Hausfeld may be the best cheap stick welder on our list, but that doesn’t mean that it isn’t packed with features. Quite the opposite is true! It’s capable of welding 18 gauge material up to 1/8”, which is pretty thick considering it’s a lighter duty machine. They recommend that you use 1/16” and 5/64” rods to get the most out of the power. It has dual heat settings so you can do small repairs as well as any smaller hobby welding. It even has a comfort fit handle! It comes equipped with thermal overload protection so the machine won’t overheat, and will automatically shut off if it gets too hot. The transformer that is included provides a smooth arc that is easy to get started, so you don’t have to struggle with it. At only 115 volts, this machine is still pretty beefy! It’s faster and easier than ever before to start doing your own welding repairs! The Amico Is a pretty amazing little machine with a lot of power to go around! It runs on voltages up to 230, which means that it’s going to be capable of putting out a huge amount of power. It comes with an electrode holder and cable, a work clamp and cable, as well as the input adaptor and plug for the wall. It’s got an incredible 60% duty cycle, so it cycles deep to get you the best possible edge. It’s got practical applications in light fabrication work, repairs, and even some light industrial work. But that’s not the best part! There’s an LED meter so you can use the amperage setting that you want because it’s so easy to set it! The power and wide application make it the best stick welder for farm use, home use, and even use in your repair garage. This little thing machine is exceptional and pretty amazing! 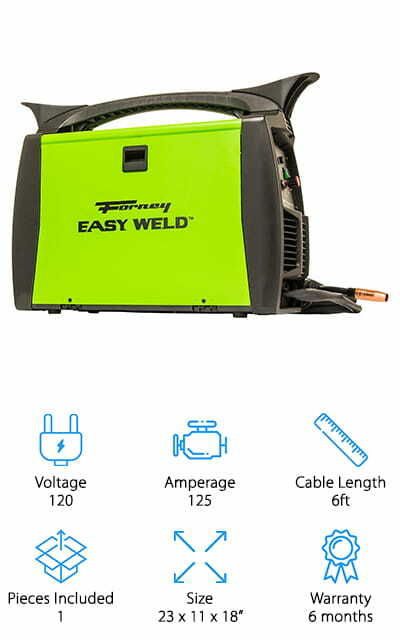 The Easy Weld machine from Forney is capable of welding 24 gauge steel, up to a quarter inch (1/4”) think. It uses only gasless flux core welding and therefore does not need shielding gas – you should not be adding any gas to this machine. These machines are perfect for light outdoor repairs around the home, hobby work, or another small project. 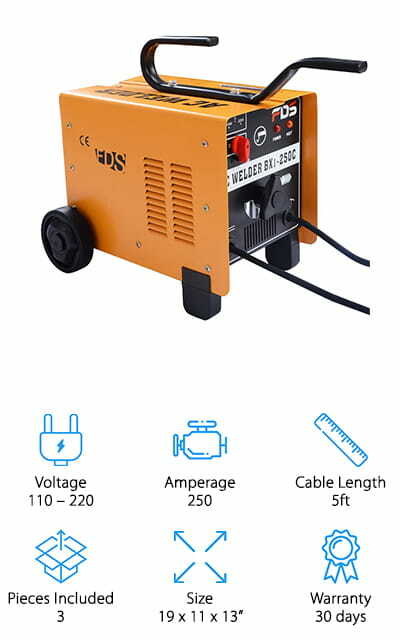 Because it doesn’t use any sort of gas like other models, it’s a plug-and-play welder with an amazing capacity to weld very thick materials. 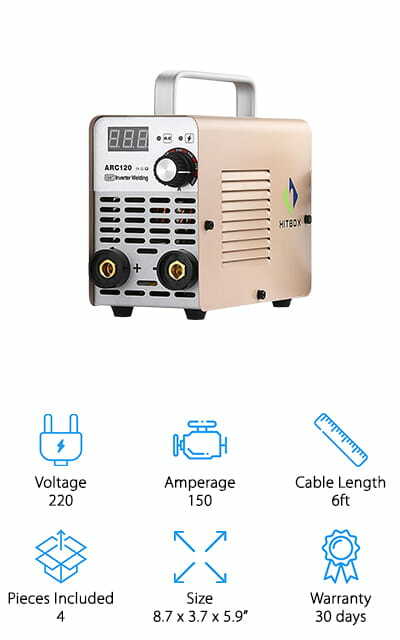 It’s perfect for hobby work, and it just might be the best stick welder for beginners due to its low voltage and amperage. It really allows you to get the hang of the work before you dive right in! Feel free to take your time learning the craft with this machine, as it’s easy to use and control. You only need to pull the trigger on the gun to get it to arc! 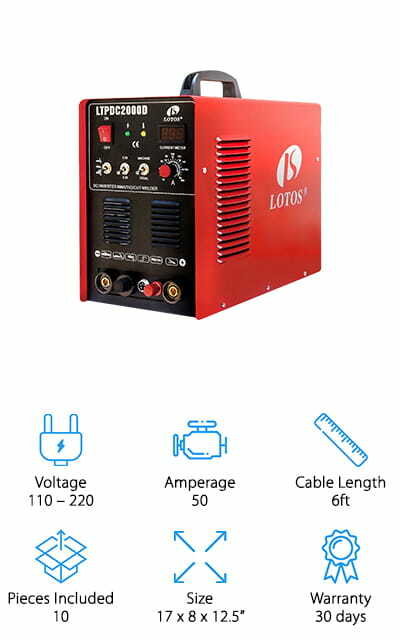 The Lotos is an amazing machine that performs three essential types of cutting and welding in one! It is a stick welder, but it can double as a TIG welder and an arc plasma cutter as well. That’s pretty amazing. The cutter function easily slices through a variety of surfaces, and you don’t have to touch the tip to the metal, which leads to a better cut. It can cut clean up to 1/2”, which is definitely amazing, we think! On top of that, it automatically adjusts the voltage to what you need and what’s available. This machine is unique because it has the capabilities of a professional machine and it’s perfect for DIY stuff on the weekends as well. You can even purchase an optional foot pedal for optimal control over the current and weld functions. Do you want to know the best part? It’s got an adjustable arc current so that you can easily start arcing. The GoPlus is another machine with alternating current, or two different settings on it so that you can choose how much you’d like to put into it. It’s portable, with wheels and an easy handle so you can roll it along with you anywhere! It’s the best portable stick welder on our list. There’s a built-in fan to help dissipate heat so it doesn’t overheat, but if it does, there’s thermal overload protection on the unit. You don’t have to worry about it getting so hot that it melts. 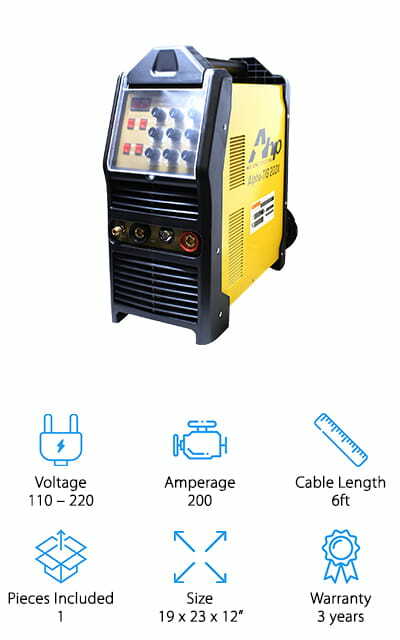 It might be compact, but the heavy-duty construction and automatically detecting current makes this welding machine stable and durable. You can take it anywhere and it won’t break or cease to function. It comes with an electrode holder, a ground clamp, a mask, and a hammer. You’ll have everything you need for amazing, reliable welds every single time, for a long time to come. 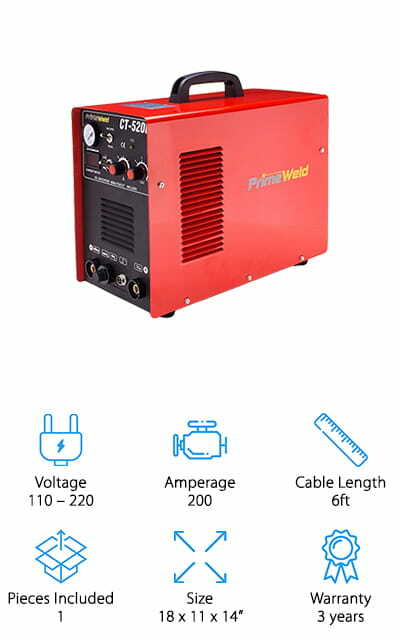 The PrimeWeld Stick Welder is another machine that pulls triple duty as a TIG welder, stick welder, and plasma cutter. We need more machines like this on the market! It’s pretty small, but it is mighty and can do a whole lot of things at the same time. Everyone loves the plasma cutter, and that this machine is portable enough to take with you wherever you go. In addition, the company has great customer service, and the machine is great for small repairs and work on smaller projects. It might be a light-duty welder, but it’s professional grade, which makes it one of the best stick welders for sale on our list. It can weld 30 gauge with ease, as well as 3/32 and 1/8 rods. It’s perfect for repairs around the house or doing light hobby work in your spare time. Some people even use it for both! It’s a great machine and you should try it! The Everlast PowerArc has no AC input and still delivers the smoothest DC arc so you can get the job done quickly and without the hassle of starting an arc. It’s got great performance and autoregulates the arc so it stays just right and doesn’t get out of hand. There’s a digital display on the front for current settings, something that’s pretty unique on our list. We love it! You don’t want your rod to stick during starting, do you? Good thing that this machine has a feature called Auto Adaptive Hot Start, which will make sure that your rod doesn’t get too hot during startup that it sticks. This was a welder built for work in the professional field. It’s the best inverter stick welder that we’ve seen in all of our research! It’s powerful enough to get the job done every time, no questions asked, and can weld between 1/16” and 5/32 to 3/16” edges. This Forney Welder is a pretty impressive machine! It has so many processes, including MIG, Flux Cored, Stick, and TIG welding, that you might not ever have to buy another welder again! It comes with a gas hose for the MIG function and a flowmeter so you know what’s going on. IT’s an incredible 190 amps to deliver the most power possible. It welds between 1/8” and 5/32”, and comes prepared with the Stick and TIG settings. So if you’re looking for something that’s so much more than a stick welder, this is the machine for you! You can get the TIG torch, foot pedal, and spool gun that you might want through the manufacturer. It even has a digital readout so you can select the arc voltage and output current. 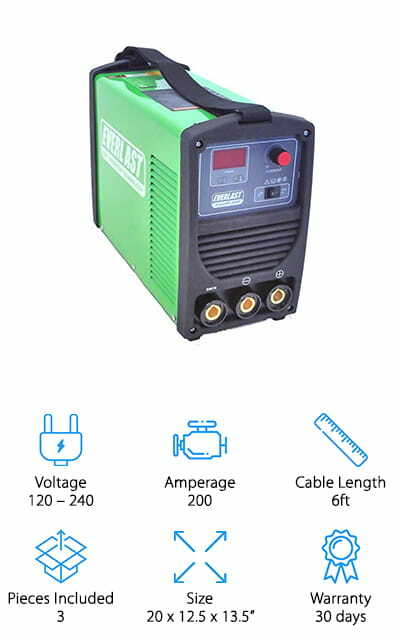 This little powerhouse can do anything you need it to do, and make all your welds fantastic – even synergetic welding is no match for this beast! The HITBOX welder is a really good cheap stick welder when you weigh features and quality with the other entries on this list. 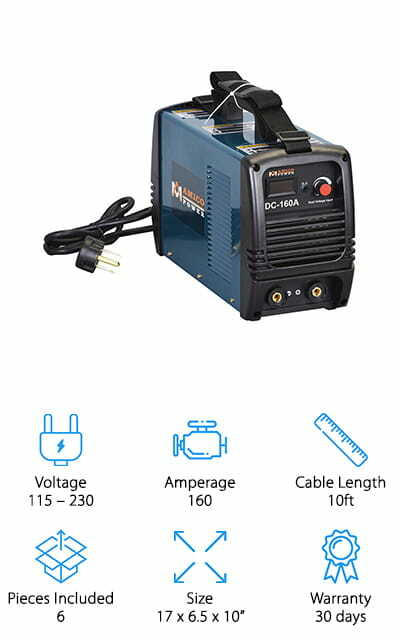 If you’re a hobbyist and you’re just looking for a machine that will get your small projects done, this is the welder for you. 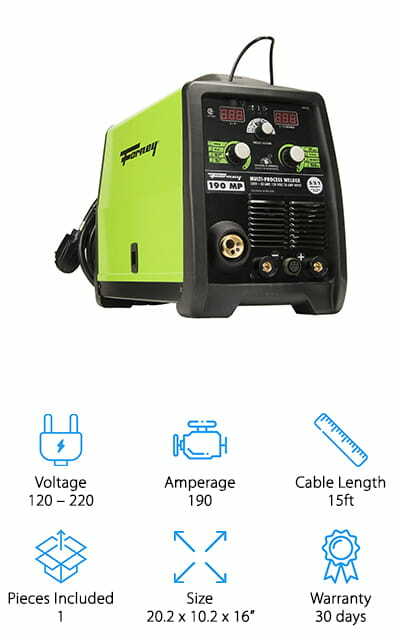 Alternatively, if you’re a beginner and you aren’t sure you’re going to like it, this is the welding machine we recommend. It’s so small and portable! It welds 1/8” and 3/32” very well, and has an amazing 60% duty cycle for its size. It even comes with a neat handbag to carry it around in, to encourage its portability. We really like how simple and single-function this machine is, compared to the others. It’s a display of what a cheap stick welder can actually do, and if all you’re looking for is a small project helper, this is the machine for you. Even then, it’s pretty amazing for its size!